Fine-tune cost-driving, reach, efficiency and sales parameters as you want. See their combined effect on Downloads, Sales, Net Profit and Total Cost. Fine-tune any value over time in various modes, including exponential growth, with live evaluation. App Developer allows for a complete Return-on-Invest analysis. Quickly check any possibilities and options. An IoT developer model is included for developers who calculate a hardware component as well. Input Values: Employees, Salary per hour, Work hours, Work days - Fixed Cost, Fixed Income - Sales Taxes - Adwords, SocialMedia Followers, Follower to Website to Downloads to Sales conversion rates, 3rd party Website downloads, App Retail Price. Dynamic Applications are fully Transparent. 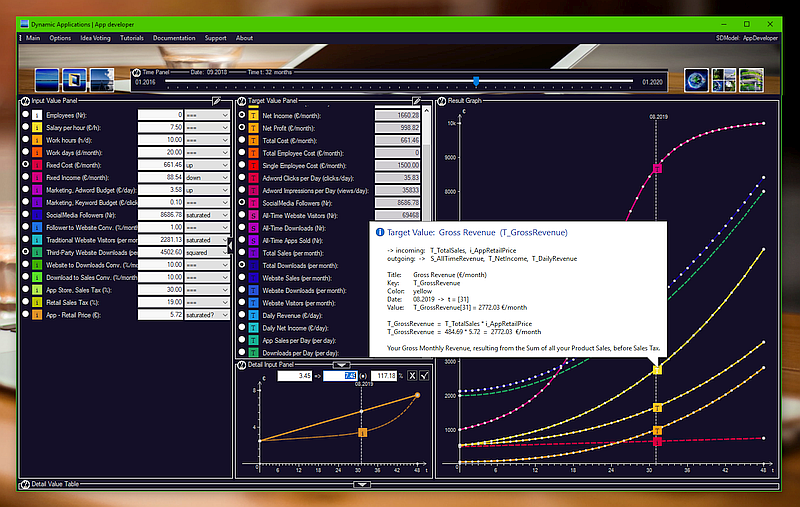 All Simulation Models are documented with ToolTips + online docs. Dynamic Applications fully protect your privacy. No Adware. No Spyware. No Server behind you. It's your business, it's your data. We respect that. Finally, Dynamic Applications are also participative. In an approach of Customer Driven Development, two user competitions allow everyone to vote with Retweets and Favs on Twitter, on our best simulation ideas to do, as well as on the platform roadmap. Every month, the top voted ideas and the top favorite roadmap issues are prioritized in development, then published free of charge in a 2-4 week cycle. Pay with a Tweet. All in all, Startup Product Manager is a reliable software application for planning and managing your business.